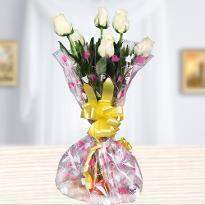 Surprise your spouse with a bouquet of roses on birthday or any other special day. 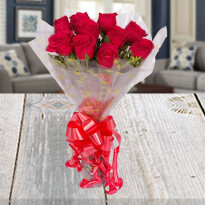 Order rose flowers delivery online to make your partner feel more loved and cared. 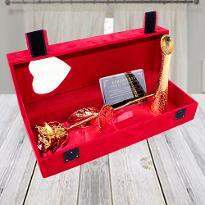 At Winni, you can shop for different color of rose flowers as well as different arrangement of red roses like heart-shape or 2-tier arrangement. 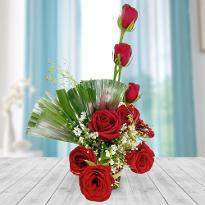 Feel free to order for personalized red rose flowers bouquet arrangements. 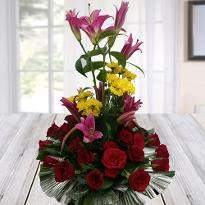 Reach to our customer support team via call or email for personalized rose flower arrangements. Bunch of roses epitomize many different things like love, care, sympathy, friendship, beauty and much more because of its variety. 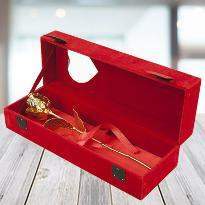 It is the most suitable gift for various events and occasions. It is the most commonly purchased flower for loved ones, friends and used for wedding and anniversary celebrations. Because of its luxurious beauty and eternal fragrance, it is known as “Queen of Flowers” that have been ruling over the heart since ages. Rose flower gets its name from Latin word Rosa. The flower of roses grows in different colors from red roses to pink roses and many more colors that have a special meaning attached with every color. The cultivation of roses goes back to the ancient time of Greeks and Romans. The magical power of rose flowers conveys the emotions without saying even a single word. The beautiful bunch of rose flowers depict a straightforward token of eternal and mysterious feelings for us to transmit and lavish. Bunch of red roses represents a universal appreciation and power to dominate unseen energy in the universe i.e. the phenomenon of never-ending love. It is the perfect blossom for every occasion. If you are hunting for red rose flowers for your special event or like to delight someone you love with the bouquet of red roses? 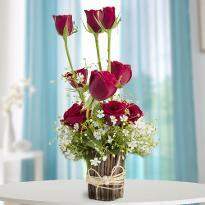 Welcome to Winni.in, where our finest-quality of red roses are perfect to keep you coming back for more! 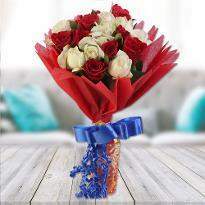 You are certain to find out the right red roses bouquet at Winni. 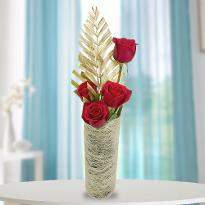 Red rose flowers bouquets are unmatched and unparalleled in its beauty and fragrance and are used for the purpose of gifting across the world. They are also a great addition to home décor and office décor. It enlivens the place by its mesmeric fragrance. 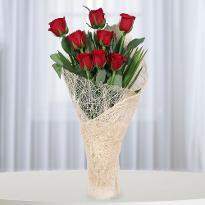 Red rose flower bouquets are the most demanded flower during the Valentine Week. 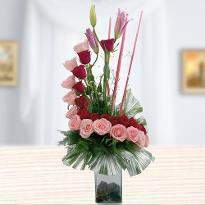 A sudden increase in demand of rose flowers bouquet in the market is observed at this time. Lovers opt for bunch of rose flowers delivery to delight their partner. You can never go wrong with this flower. 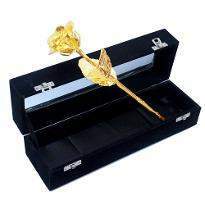 Winni also provide customized rose flower bouquets that you can order for your special one. Species roses are best known as wild or pure roses of natural origin. They have been originated date back to ancient history around the northern hemisphere. Species roses are the ancestors of all modern roses. The petals and leaves of species roses were found in the tomb belonging to ancient Egyptians. They were used in garlands which had worn by loved ones then these were left in the tombs with the bodies. There are many different varieties of wild roses. They usually bloom once in summer. Old garden roses have a gentle beauty and fantastic fragrance. They were popular prior to the 20th century. They are generally tough, durable shrub and many of them are considered more fragrant than their modern counterparts. Most of them bloom once and used in the landscape similar to Hydrangea. They grow quite large and they can tolerate pruning. There are different classes of old garden roses namely alba, Centifolias, Moss, Bourbons, Damask, Gallicas, Hybrid Perpetual, China, Noisette, Portland, Tea Roses, Hybrid Kordesii, Hybrids, Hybrid Musks, Hybrid Rugosas, Polyantha. This group of roses is very popular and they are the predecessors of modern roses. This group rose is the result of crossbreeding the hybrid tea with the polyanthus. The color of these roses is rich, vibrant and varied. Hybrid tea roses are the most popular roses in the class of Modern Roses. Modern roses require proper care and these roses do not adapt well to colder environments. Hybrid tea roses, Grandiflora roses and Floribunda roses are the most popular roses found in the class of Modern Roses. 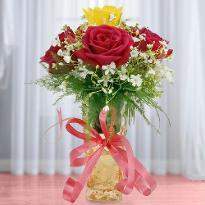 Presenting a bouquet of Valentine's day roses as a gift shows deep emotions and appreciations for the receiver. The different color resembles different meanings. Have a look on these colors of roses. 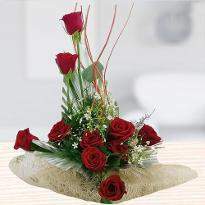 Red roses - Red roses are the symbol of love and romance that always speaks “I Love You” from your side. It also reflects beauty and perfection. 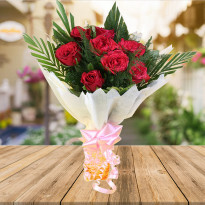 A bunch of red roses is the best gift that you can give it to your special one on birthday, anniversary, Valentine's day roses and many more occasions. 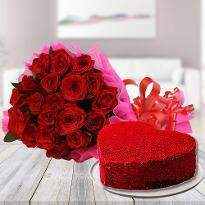 Get Valentine rose delivery from Winni. 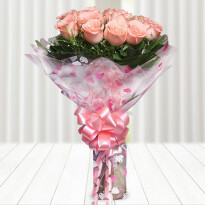 Pink roses - Pink roses symbolize grace, admiration, gentleness, joy, admiration. These roses are best for every occasion. It also conveys gracefulness and happiness. 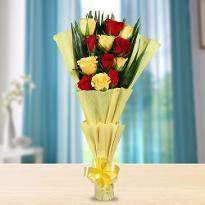 Yellow roses - Yellow roses are the epitome of eternal friendship. Cheerful, elegant and bright are some of the words that trigger our mind when we think of yellow roses. 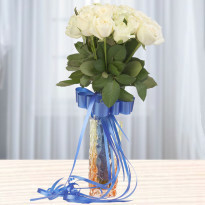 White roses - White color represents purity and innocence. The beauty attached with white roses can make anyone’s day brighter. White roses signify pure love and beauty. Orange roses - The orange color evokes energy and indicates enthusiasm, wishes and cheerfulness. Gifting orange roses can symbolize your passionate romance. 1. The fossils of roses have been found in Colorado around more than 35 million years ago. 2. Red roses were the most sacred flowers and were used as offering to Goddess Isis in ancient Egypt. The evidence of roses were found in the Egyptian tombs. 3. Red roses have medicinal value. It rejuvenates the skin and gives a brighter glow. It improves the immune system. 4. Red roses are the natural stress busters. It is one of the most important ingredients in the perfume industry. 5. Roses are also used in songs. According to a research, around 4000 songs are dedicated to roses. 6. Certain species of roses can reach 23 feet in length. 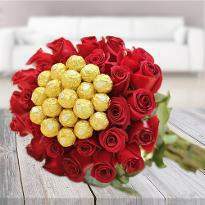 Why choose Winni for online red rose Flowers bouquet delivery? You can explore different varieties of roses for every occasion and celebration. 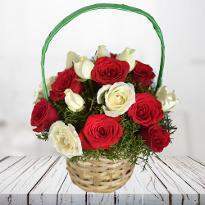 You can go for single rose delivery in case you do not want to purchase bunch of rose. 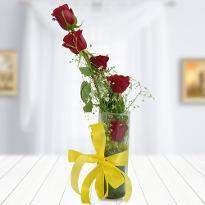 To enhance the love in your life, this time surprise your special someone by gifting bunch of roses from Winni. 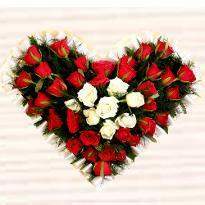 Rose flowers bouquet have served many hearts. You can never go wrong with a bouquet or bunch of roses. Bangalore, Pune, Bilaspur, Chandannagar, Chandausi, Chandrapur, Chapra, Darbhanga, Darjiling, Datia, Davanagere, Gandhinagar, Gangapur, Gangavati, Haldia, Haldwani, Hugli-Chinsurah, Jhansi, Pallavaram, Rampur, Ratlam, Ropar, Sri-Ganganagar, Tiruvannamalai, Trivandrum,Coimbatore, Dehradun, Ludhiana, Navi Mumbai, Kanpur, Ranchi, Faridabad, Vizag,(Visakhapatnam), Bhubaneswar, Mohali, Allahabad, Panchkula, Budaun, Bulandshahr, Bundi, Burhanpur, Buxar, Calicut, Champdani, Abohar, Achalpur-Amravati, Adilabad, Adoni, Agartala, Ahmednagar, Aizawl, Ajmer, Akbarpur, Hyderabad, Chennai, Kolkata, Delhi, Mumbai, Gurgaon, Nagpur, Patna, Bhopal, Indore, Thane, Akola, Alandur, Alappuzha, Aligarh, Allahabad, Ambikapur, Ambur, Amravati, Noida, Amreli, Amroha, Anand, Anantapur, Anantnag, Arrah, Asansol, Ashokenagar-Kalyangarh, Aurangabad, Avadi, Azamgarh, Badlapur, Bagaha, Bagalkot, Bahadurgarh, Baharampur, Baidyabati, Balasore, Ballia, Bally, Bhilwara, Bhimavaram, Lucknow, Ahmedabad, Chandigarh, Jaipur, Ghaziabad, Bhind, Bhiwadi, Bhiwani, Bhopal, Uttarpara-Kotrung, Yamunanagar, Yavatmal, Zirakpur, Udaipur, Udgir, Udupi and many more cities.